The Assyrian National Petition presented to the World Security Conference in San Francisco, California USA on May 7, 1945 by His Holiness, Mar Eshai Shimun. Printed by Kimball Press, New Jersey - USA on March 25, 1946. THE ASSYRIAN NATION of today is the remnant of the once great Assyrian Empire, and the greatest missionary Church the world has ever known. Their status as a millet, "nation", under the leadership of their Patriarch, known as the Patriarch of the East, was recognized and tolerated under the Parthians, the Sassanides, the Arab Khalifs, the Mogul Kahns, and the Ottoman Sultans. Until World War I, the Assyrian nation lived in the mountains of Kurdistan to the North of Beth-Nahreen (Mesopotamia) and around Lake Urumia, in Persia, under the spiritual and temporal leadership of their Patriarchs. The Assyrians in Kurdistan, although nominally subjects to the Turkish Government, enjoyed a great measure of autonomy. The Turkish Government satisfied itself with a tribute paid through the agency of the Patriarch, His Holiness the Mar Shimun, a title used by the successive Patriarchs to signify the foundation of the Church of the East by Saint Peter. This was the state in which the Assyrian nation lived prior to the outbreak of the First World War. The respective European powers — England, Russia, and France — had for many years been interested in the Assyrian nation in view of the strategic position which they held, and their undeniable quality as soldiers. The representatives of these Powers made regular tours among the Assyrians, disseminating the propaganda of their respective governments — an act which the Assyrians were unable to avoid and the Turkish Government (equally) powerless to prevent. This naturally increased the suspicions of the old Turkish Regime against the Assyrians, suspicions which were for the most part unwarranted and grossly exaggerated; but the fact is that these suspicions did exist, and when the tragic hour struck in 1914, the small Assyrian Nation was among the first to suffer the tragic consequences over which it had no control. In a document such as this, it is not possible to go into detail of the series of happenings which have already been documented by various writers. † However, whether with the knowledge of the central government or through instigation of local Turkish officials, the Mohammedan Kurds carried out a wholesale massacre of the Assyrians of the district of Albaq Gawar; men, women, and children alike were slaughtered, only young women being spared to suffer the worst fate of Harem life. The then Patriarch, Mar Benyamin Shimun, alarmed by the tragedy, called a general meeting of all the leaders of the nation, composed of both the bishops and the Maliks who met in Diz on the 18th of April, 1915. After lengthy deliberations it was unanimously decided that — in view of the fact that the Turkish Government had failed to observe its solemn obligation to safeguard the lives and property of the Assyrians — the Assyrian nation accept the invitation of the Allies and particularly that of England, France, and Russia to join the common cause and to fight to the victorious end as their Smallest Ally. † In reply to the ultimatum of the Assyrian nation, the Turkish Government informed the Patriarch Mar Benyamin Shimun that if the Assyrians joined the Allies, his brother Hormizd, then a student at Constantinople (and held as hostage) would be put to death. The Patriarch who had hitherto exhorted his people to be patient in suffering, remained unmoved by the threat. Hormizd was accordingly put to death most cruelly. In the meantime, the Patriarch made a personal contact with Chernosoboff, Commander-in-Chief of the Russian Eastern armies, who was then in Salmas in Northwest Persia and who informed him that due to pressure on the Western front, the Russian armies were then actually withdrawing from Persia, and therefore, the help promised to the Assyrians was not forthcoming. It was at this time that the Assyrians around Lake Urumia suffered a terrible fate at the hands of the incoming Turkish armies and the Kurdish and Persian irregulars. The Assyrians in Kurdistan, in the meantime, had set a line of resistance west to the Vilayet of Mosul and northwest on the Persian border. 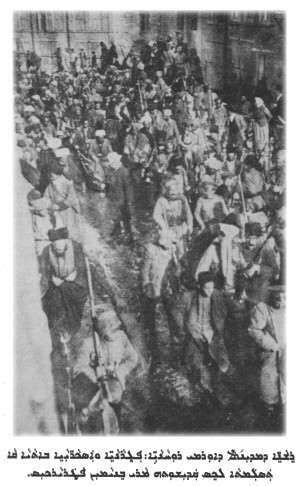 They were attacked incessantly by powerful units of the Turkish army and swarms of Kurdish irregulars, yet they held on tenaciously for about four months, but being vastly outnumbered both in men and material, they finally had to retreat, and join the Russian Forces who had by now returned to Salmas and Urumia. Here they were organized into regular units and armed by the Russians, and they distinguished themselves in many an engagement against the common foe. However, the Russian Revolution of October, 1917, left the Assyrian nation stranded, and had from now on to fight alone against the Turks, the Persians, and the Kurds. In fourteen major battles the Assyrians were victorious, but the incessant pressure of the Turkish Regulars and the Kurdish irregulars necessitated a shortening of the line. This action on the part of the Turkish army was motivated by the fact that the Assyrian army was threatening seriously the northern flank of their armies that were engaged in a deadly combat with the British armies in Mesopotamia and Southern Persia. In the meantime, our supplies were getting exhausted; the Assyrians were being persistently attacked from the north by Ali Ehsan Pasha's 5th and 7th divisions, from the south by the 6th division under Haji Ebrahim Beg, from the west by the 12th division under Haidar Beg, while in the east we had our backs to Lake Urumia. Indeed, the situation was growing desperate. It was at this juncture that the British Government through the agency of Captain George F. Gracey (D.S.O. ), who was acting under the orders of the Intelligence Service, came especially for the purpose from Van — his headquarters — to encourage the Assyrians to organize their resistance against the Turks. At a conference held in December, 1917, or early January, 1918, in the name of England, Capt. Gracey undertook to furnish immediately the funds necessary for the payment of the troops and non-commissioned officers. For the future he promised, the proclamation of the independence of the Assyrian nation. Colonel Nikitine, the Russian Vice Consul, and Monsieur Paul Coujole, a French Medical Officer, Chef De L'Ambulance Francaise du Caucase, were present on the occasion and have testified to the fact. † It was also on this occasion that, on the advise of Captain Gracey, the Patriarch Mar Shimun Benyamin, accepted an invitation to a meeting with Simko Agha, a Kurdish Chief, at which the Patriarch, along with about a hundred leaders who accompanied him, were murdered treacherously. This was the greatest blow the nation could have suffered. Soon after this, K. M. Pennington, a British Flight Officer, who, at a great risk to his life, landed on a grazing ground with a message from the British General in Hamadan, urging us to make contact in Sainkala with the British unit under the command of J. J. McCarthy, one hundred miles south of Tabriz and about half way between Urumia and Hamadan. At the command of the Patriarch, Polos Mar Shimun XXII, who succeeded the Patriarch Mar Benyamin, an Assyrian force under the leadership of General Petros Elia (one of the Assyrian Commanders) along with the bishop Mar Yosip1 effected a junction with McCarthy's unit. However, the help thus promised and which was sorely needed never reached the Assyrians, now concentrated in the Urumia district. The Turkish forces in the meantime increased the pressure, and then it was found that the British Forces, which were already locked in a deadly combat with the Turks and harassed by swarms of Arab irregulars, would not be able to help the Assyrians effectively. † Thereupon, it was decided to make contact with the British forces in Hamadan. A general retreat took place; forcing their way through a hostile territory, the Assyrians finally reached the British Forces in Hamadan. It was during this — the worst Odyssey in the history of the nation — that thousands of men, women, and children alike died of starvation and disease. Thus ended the first Assyrian chapter of the horrors of World War I, little revealing that a worse fate was yet in store for this gallant remnant of the most ancient Christian church and nation. IN THE MEANTIME, thousands of Assyrian refugees were moved to Baquba, near Baghdad, where the British military authorities had established a great camp for their reception, and very good care was taken of them. Their able-bodied men at the same time, however, were formed into a military force, or otherwise employed for other useful purposes connected with the war. The first Assyrian force under the British command — and headed by Rab Khaila David d'Mar Shimun, father of the present Patriarch — were from now on employed with telling effect against the successive Kurdish and Arab uprisings. It was the Assyrian force that saved the swamping of our rule in the Arab revolt and it was they who (as the C.O. in the field, Colonel Cameron, declared) rolled back the Turkish invasion of Iraq in 1922 and 1923 at a time when the Iraqi troops were utterly unfit to take the field themselves. I have sent a copy of a memorandum I have written on the Assyrian question from the time your people joined forces with us against the Turks in 1918 up till six months after the Armistice was signed. I have made a strong point of the fact that your people were definitely promised by me (acting under orders from headquarters, of course) that they would have their country restored to them, and that my orders and only reason for raising the Assyrian contingent in Hamadan in 1918 was to drive the Turk out and reoccupy the country. I do hope the Foreign Officer will do something and do it now and before it is too late. No good can come out of delaying matters and the British Government should face the position and do the right thing. It is all very difficult I know, but surely not impossible. After all, England is a big nation and we did, I suppose win the war? However, we didn't lose it, and if we had, there would have been a different story to tell. It is clearly our duty to fulfill promises made to people who stood by us when we were in urgent need of all the help forthcoming. We did not have too many staunch and loyal friends in the East in 1918. Few people realize what your unfortunate people suffered and are still suffering in return for their loyalty to England. I will do my best to make known the terrible hardships they suffered under my own eyes. Never shall I forget that retreat from Urumia when I met the panic stricken people on Bidjar Road and never do I want to see anything like it again. One thing is now certain and that is they cannot be left to the tender mercies of the Arabs, whose one ambition in life appears to be to destroy them. This of course, was very obvious to anyone who cared to think long before the last trouble. "They gave their services freely, not to the Arab, but to the British Government, in the hope that a measure of justice would some day be vouchsafed to them. We had used them so freely against Turks, Arabs, and Kurds alike." † In 1920, the Baquba camps were closed, and the Assyrians for all practical purposes were let loose by the British to seek a solution to their own problems. About half the Assyrians made their way back to their ancient home in the Hakkiari Mountains in Kurdistan, which was now no man's land. The rest were dispersed throughout Iraq to eke such existence as they could; some were settled as tenants to Arab and Kurdish land owners, and others found such employment as were available. The majority of the Assyrians from Urumia also found their way back as subjects to the Persian Government, but a considerable number of them, apprehensive of the future, remained in Iraq. Assyrian Levies are to relieve the British and Indian troops in Iraq, take over the outposts in Mosul district and Kurdistan, previously held by Imperial garrisons and fill the gap until such time as the Iraqi national army is trained to undertake these duties. British officers such as Captain MacNarny and Captain Renton embarked on an intensive campaign persuading the Assyrians to join the Levies; they traveled into Hakkiari and reached the remotest Assyrian villages in Kurdistan. The Assyrians believing that the British Government meant to observe the promise of a national home (made to them) responded unanimously. 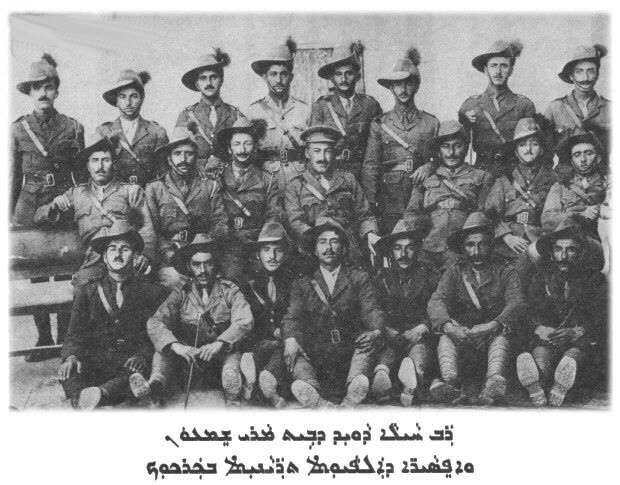 An Assyrian Force of 6,000 strong, known as the Assyrian Levies under the British command and led by Rab Khaila, General David d'Mar Shimun5, along with Assyrian officers, was trained and equipped during the year of 1922. In 1923, the Assyrian Levies were placed under the command of the Royal Air Force and commanded by Colonel Commander H. T. Dobbins (D.S.O. ), 1922-1926. The Turkish threat to the Mosul Vilayet was imminent; they stirred up the Kurds to rebellion against the British. The Assyrian Levies were used successively both against the Turkish regulars and the Kurds, who inflicted defeat upon the latter in numerous engagements, and thus saved Iraq from total disaster. † This, however, increased the hatred of all the Moslem elements against the Assyrian Christians, which were now looked upon as an effective instrument in the imperialistic policy of the British Government. Thus depleted of their man power (all the able-bodied men having enlisted in the Levies), the Assyrians in Hakkiari were now suddenly attacked by the Turkish Forces and for the second time since 1915, they were again ousted from their homes. It must be said that on this occasion, the British once more, despite the timely S.O.S., failed to give any assistance to the Assyrians in defending their homeland. In the meantime, the British and the Turks were disputing the ownership of the Mosul Vilayet, and the strongest argument presented by the British in their claim was that since the Assyrian nation had been dispossessed of their homeland by the Turks, they must be recompensed by a similar settlement within the Mosul Vilayet. "It is not our duty to enumerate all the conditions that would have to be imposed on the sovereign state for the protection of these minorities. We feel it our duty, however, to point out that the Assyrians should be guaranteed the re-establishment of the ancient privileges which they possessed in practice, if not officially, before the War." "Whichever may be the sovereign state, it ought to grant these Assyrians certain local autonomy, recognizing their rights to appoint their own officials and contenting itself with a tribute from them, paid through the agency of their Patriarch." These recommendations, however, remained a dead letter, and no serious attempt was ever made to honor them. In the meantime, the Assyrians in Iraq continued to suffer untold hardships, mental, physical, and spiritual alike -- disappointed and disheartened in the extreme by the failure of the British Government to fulfill its promises towards them -- and looked upon with great suspicions by the Iraqi Government and constantly attacked by the Iraqi press as a foreign and unwelcome element -- they felt uneasy of the dark future facing them. The Iraqi army was jealous of the achievements of the Assyrian Levies as a military force and looked upon them as an instrument in the hands of the Mandatory Power, rather than an asset to Iraq. Individual cases of injustice against the Assyrians were piling up, and they could expect no justice from the Iraqi Government or the Iraqi courts. † The majority of those settled as agriculturists were settled in malarious places, all of whom became afflicted with malaria resulting in a very high rate of mortality, approximating in the case of adults 30% while in the case of infants it exceeded 50%. THE ASSYRIAN NATION, apprehensive of its future, petitioned to the League of Nations to find a solution of its problem before the mandate over Iraq was lifted. In 1932 the ASSYRIAN LEVIES, fearful of the future of their families in accordance with the terms of their contract, gave the British authorities one month's notice, at the end of which period they were to lay down their arms. A national meeting was called at which the representatives of the Assyrian Levies were also present and on June 17, 1932, a national petition was sent to the League of Nations and to the British Government in which a number of specific requests were made to insure the integrity and safety of the Assyrians. On a definite promise given by the British High Commissioner, Sir Francis Humphreys, to support certain specific claims contained in the national petition, I was requested to use my influence with the Assyrian Levies and urge them to continue in service. This I did successfully. The Assyrian Levies did continue in service. However the promises made by Sir Francis Humphreys were not kept -- and I returned from Geneva empty handed. His Majesty's Government fully realized its responsibility in recommending that Iraq should be admitted to the League of Nations which was in its view the only logical way of terminating the mandate. Should Iraq prove herself unworthy of the confidence which had been place in her the moral responsibility must rest on His Majesty's Government, which would not attempt to transfer it to the Mandates Commission. In the meantime, the Iraqi press embarked on a violent campaign of suspicion and hatred against the Assyrians with the full knowledge and encouragement of the Iraqi Government. 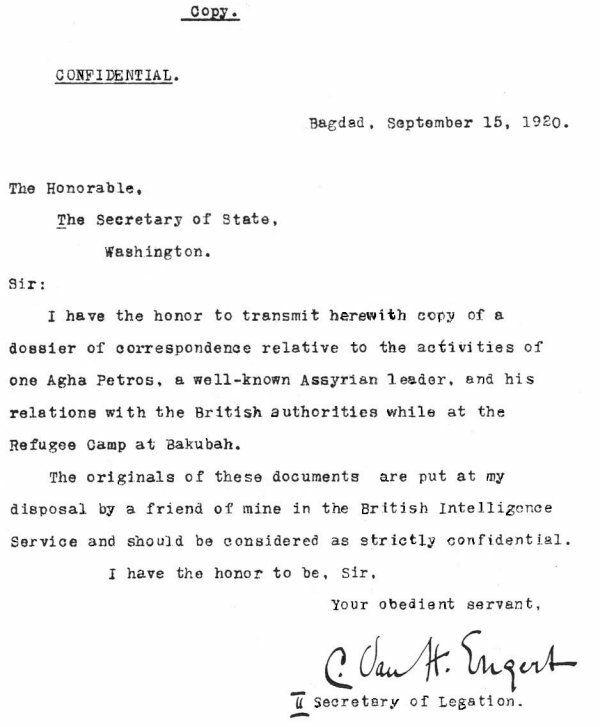 † In April, 1933, I was invited to Baghdad by the Iraqi Government to discuss the settlement and a few days later was informed that I was under detention. The agitation against the Assyrians, in the meantime, took even a more violent and threatening aspect -- it was now directed on religious issue. At the same time the Assyrian leaders with whom I was not permitted to communicate, were subjected to all sorts of ill-treatment, the plain object of which was to drive them into despair. 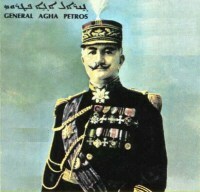 The climax came during a meeting held in Mosul on the 10th day of July, 1933, when the Mutasarif (Governor) and his British adviser, Col. R. F. Stafford, told the Assyrian leaders to either submit to the policy which the government had decided for them — which was contrary to the letter and spirit of the homogeneous settlement recommended by the League of Nations — or else leave Iraq. The Assyrians did leave Iraq. On July 14th and 15th, 1933, an Assyrian group of a few hundred men, carrying their rifles which they had legally acquired on the termination of their service in the Levies, left Iraq for Syria. The rifles were carried only as a means of protection while passing through hostile territory and upon arrival in Syria were handed to the French. On reaching Fesh Khabur on the Syrian frontier, they wrote informing the Iraqi authorities of their action and assuring them of their peaceful intention and begging that their families and the rest of their compatriots, who may wish to join them, be permitted to do so. In the meantime the wires between London, Paris, Iraq, and Syria clicked incessantly, and the Assyrians were told by the French authorities that they must return to Iraq. Their arms were given back to them. † The full force of the Iraqi army and a few thousand gendarmes and the Iraqi Air Force which had been in the meantime rushed up to the border, fully armed and prepared for a day such as this, were waiting on the other side of the River Khabour. The Assyrians were assured of the good intentions of the Iraqi government, their only intention being to reach their families; they accepted the assurances and forded the river. But instead they were fired on from every side by the Iraqi army with every weapon at their disposal. A battle ensued in which about three hundred Assyrians engaged the whole of the Iraqi army. Those Assyrians that were able to break through the Iraqi lines reached their villages, and about half of them re-crossed into Syria and were interned by the French. Losses on both sides were light and it was hoped that this would be the end of it and the incident would close. However, the fanatic Iraqi army, led by the notorious Bakir Sidqi, and the equally ruthless Yasin Pash Al Hashimi (the Prime Minister) and Hikmat Sulaiman (the Minister of Interior) a wholesale massacre of unarmed Assyrians, men women, and children alike followed — it was conducted by the Iraqi army in uniform. "I saw and heard many terrible things in the great war, but what I saw in Simele is beyond human imagination." But this was not all -- the perpetrators of the massacre were decorated; Bakir Sidqi was elevated to the rank of Pasha, and each of the others, responsible for the horror committed on the defenseless Assyrians, was rewarded in some way or another. On August 18th, 1933, I was de-nationalized without trial and deported from Iraq to the Island of Cyprus in the Mediterranean. After great efforts I was able to secure a permit from the British Government, which enabled me to proceed to Geneva, and plead the Assyrian case before the League of Nations.8 My earnest plea for an inquiry commission to be sent to Iraq to investigate the facts leading to the massacre and the existing situation of the Assyrians was ignored. "... At the same time, those facts could not possibly be regarded as justifying the excesses which had been committed. The apportionment of blame, however, was a somewhat barren proceeding." In the meantime, efforts were made by the League of Nations to find a home for the Assyrians outside Iraq, but with no result. Finally the French Government offered a settlement in the region of the Ghab in Syria. However, owing to circumstances unknown to the petitioner, the French later declared that the scheme could not be carried through. Thus the question remained unsolved and the Assyrians were left in a worse plight than before. Those in Iraq were left in the same condition as prior to the massacre, in addition to the fact that they were now hated and despised more than ever. † About eleven thousand or so, victims of the massacre, who had been settled temporarily on the River Khabur in Syria, were told that they had to remain there. This was the situation of the Assyrians in Syria and Iraq in 1937. All these years I have not been permitted to visit them. Nevertheless, we all hoped and prayed that time -- the great healer -- might in due course effect a cure; and the Assyrians may at last find peace and rest. In the meantime, however, the dark clouds of strife and war were growing daily more ominous, and it was clear that the nations of the world would soon find themselves locked in the deadliest combat of all times. THE BRITISH GOVERNMENT, fully realizing the seriousness of the situation, had once again embarked on an intensive campaign of recruiting every able-bodied Assyrian, and thus bring the Levy force to required strength. The Assyrians again responded unanimously, so that by 1940 (when the war was declared) every Assyrian between the ages of 17 and 45 had volunteered in the Levies. It was the Allied cause again — the cause of democracy — which had failed them badly in the last war; nevertheless, they believed again that the Allies would this time do justice to their cause. Therefore, when the well organized Axis-fomented rebellion broke out in Iraq in 1941, led by Rashid Ali Al Gailani, the Assyrian troops numbering a few thousand strong, were the only Force on which the British could rely to save this vital route of communication and supply for the Allied Nations. It must be remembered that in 1941 Great Britain was fighting with her back to the wall against all the Fascist hordes. She needed every friend and such friends in the Middle East were sadly lacking. On May 2, 1941, the Iraqi Army marched against, and attacked, the Royal Air Force base at Habbaniyah near Baghdad. It was stated that the Iraqi strength around Habbaniyah was estimated at about 15,000 regulars and about 45,000 irregulars composed of Arab Tribesmen, and they were assisted by the Iraqi and the German Air Force, which was now operating from Baghdad, Mosul, and elsewhere in Iraq. The Assyrians fought valiantly — assisted only by certain units of the King's own regiment which was flown from Egypt and a small number of Royal Air Force fighter planes — and finally defeated the enemy inflicting heavy losses upon them. The losses, on the part of the Assyrian defenders, were also considerable. They followed the enemy to Fellujah where it tried to make a last stand, but they finally defeated and destroyed him completely. By saving Iraq from the Axis, the Assyrians saved the Iraqi oil which was vital to the maintenance of the Allied fleet, as well as the air and ground forces in the Mediterranean theatre of war. They saved the only overland route by which the Allies — the United States of America, and Great Britain — were able to help the Great Russian Ally. The occupation of Iraq by the Germans would have laid open the back door to Palestine, Egypt, and indeed the whole of the Middle East countries. They contributed to the defense of the whole of the Middle East — they have been employed in Iraq, Palestine, and Cyprus. Strong Forces of Assyrian troops have also been employed in Dalmatia, who have distinguished themselves against crack German divisions. These are only some of the major exploits of the Assyrian troops. Thus, the Assyrian nation, the smallest ally, has proved itself to be of the greatest value to the cause of all the Allied Nations, and of which they are justly proud. It is a repetition of the events that brought about the savage massacre of 1933 upon them, and they are fearful of the future. The Iraqi Government has already proved itself unworthy of the confidence placed in it, and the British Government has been unable to protect their life and property. The Iraqi Government itself has been subject to one Coup d' Etat after another, many of its high ranking officials have died a violent death or fled into exile. Therefore, it is clear that even if there were some favorably inclined officials in Iraq, they would never have the ability to give protection to the Assyrians. "They were unpopular with the people of Iraq before Rashid Ali's revolt, and the large part which they played in the discomforture of the Iraqi army at that time will no doubt rankle for years. Sir, with these facts in view, I as the Patriarch and legal representative of the Assyrian nation, have the honor to bring to your attention the plight of this ancient Christian nation, which now stands at the cross-roads which spell total extermination — or survival. Along with its disappearance would also disappear the most ancient Christian Church in Christendom — one of the richest cultures the world has ever known — and the Aramaic language, the language of Christ, which is the language of the Assyrian church and people. What is more, the thousands of Assyrians who have died for the cause of freedom and justice along with the millions of those of United Nations, would have died in vain. It is the principle that matters and not the quantity; justice is indivisible. It is small nations such as the Assyrians that need protection, and not vice versa. With firm faith in the guarantees of the Atlantic Charter and the subsequent declarations pertaining to freedom, justice, and equality for all peoples, both large and small, and relying upon justice of our cause and above all in the Almighty God, Author of all justice, I submit to your Honor this petition for the consideration of the proper authorities. The Assyrians are a people who existed in the Middle East from the dawn of history. Assyria is their home, and by reasons of history they have an undisputed right to their survival as a people in that home. In consequence of the last War (World War I), they are now settled in many countries, viz. : Iraq, Syria, Iran, Russia, United States of America, and other countries. If such a home were granted them under an international organization that is to be set up, they would congregate in that home, which would enable them to live free from want and fear, and to preserve their Christian faith, their language, and their ancient culture. The Assyrians are a peaceful people and anxious to live with all their neighbors in peace and amity, and to cooperate with them to the fullest extent, irrespective of religion or creed. With this end in view, I offer my prayers to the Lord God of Hosts for an early termination of the present conflict (World War II), the success of the conference of Allied Nations, and the international organization that is to evolve therefrom. * But for few minor typographical corrections and other slight matters, the text of the original petition has been kept intact. The footnotes were no part of that Petition. They are added to this edition only for elucidation and corroboration of the text of the Petition. 1. And Zaya d'Beth Mar Shimun, brother of the Patriarch. 2. Lt. Col. Sir Arnold Wilson (K.C.I.E., C.M.G., D.S.O., M.P. ), Mesopotamia: A Clash of Loyalties. London: Oxford University Press, 1929, p. 291. 3. Lt. Col. Sir Arnold Wilson's article “The Crisis in Iraq”, in the Nineteenth Century Magazine, October, 1933, p. 415. 4. “The Assyrians saved the British Army from utter disaster in 1920.” — Lt. Col. Sir Arnold Wilson's Mesopotamia: A Clash of Loyalties. London: Oxford University Press, 1929, p. 291. 5. Father of the present Patriarch. 6. League of Nations Document, C 400 M. 147, 1925, VII, p. 490. 7. “The Crisis in Iraq,” p. 412. 8. This was given only after the British authorities had exacted a written statement from the Petitioner pledging him to remain silent while in England. Thus it was that he was unable to place before the British public the true facts of the Assyrian case, or to defend himself against the many false accusations lodged against him by those antagonistic to the just cause of the Assyrians. 9. March 9, 1944, “Our Smallest Ally”, p. 10-11. 10. Capt. Somerset Struben De Chair stated with resounding accent: “The Iraqi coup had failed by so little and the Iraqis hate the Assyrians; more than they hate the British, did they hate the Assyrians . . . and once more the British Empire owed so much to few . . . ” — The Golden Carpet, London: Faber & Faber. 1944. p. 48. "Growing up as a child in Chicago, my father who was an Assyrian, and who married my mother (a Polish woman), he never talked much about his life or his heritage or his family background. Its great that through this website, it has helped me learn a little bit more about who I am on my father's side of the family, and get some answers to many questions I had thought about over the years. Again thank you!"